Early voting for the 2017 constitutional election begins on Monday. Elections are being held in several municipalities throughout the Rio Grande Valley for judicial, mayoral and city commission positions. 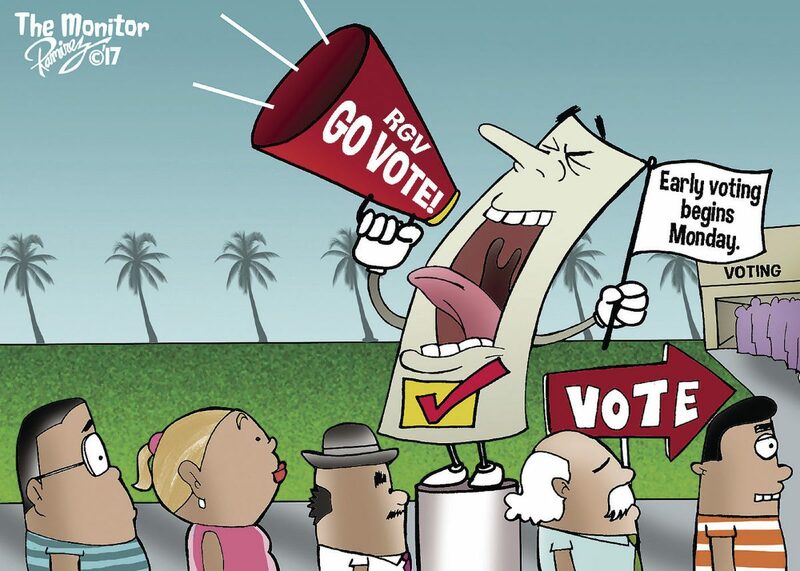 While The Monitor’s Editorial Board has a policy of not endorsing specific candidates or races, we do endorse the idea that all citizens take the time to vote and to know what is on the ballots before you go vote. The State of Texas has seven constitutional amendment propositions on the ballot. Our editorial board has studied these propositions and agree to five, but object to two amendments. We offer the following recommendations for voters to consider when filling out their ballot. For a sample list of the ballot, go to www.votetexas.gov. Early voting runs through Friday, Nov. 3. Election Day is Tuesday, Nov. 7. Translation: This amendment would allow partially disabled veterans to take a property tax exemption on their homes if their homes were partially donated to them. Our take: VOTE YES. This makes sense and expands upon a previous constitutional amendment passed in 2013 by voters that allows disabled veterans whose homes were completely paid for by charities to claim a property tax exemption. This would add partially disabled veterans whose homes were partially donated to also claim the property tax exemption. As sponsors of this legislation point out, this would help protect disabled veterans who cannot afford the taxes and are at risk of losing these homes. Translation: This would change the home equity borrowing system in Texas by lowering the cap on home equity loan-related fees from 3 to 2 percent; allowing home equity loans against agricultural property; allowing the refinancing of a home equity loan with a purchase money loan; and allowing advances on a home equity line as long as the principal is below 80 percent of the fair market value of a borrower’s house. Our take: VOTE YES. The State of Texas entered into the home equity loan market relatively late and with much reluctance. As such, lawmakers tied many lending conditions and restrictions to these loans. This amendment would lift some of these limits and help make loans more accessible, lower costs for borrowers and give consumers more choice, while still maintaining and protecting a stable housing market in Texas. Translation: Ensuring that all gubernatorial appointment slots remain filled and productive during a transition from one administration to the next. Our take: VOTE YES. This amendment addresses concerns about some gubernatorial appointees being held over in their positions long after their terms have expired and would prompt the appointment of new volunteers and ensure these positions were rotated and filled by qualified persons. It also would better allow for the Texas Senate to hold confirmation hearings on replacement appointees. Translation: Aside from the notification, this would allow the Legislature to require a waiting period of up to 45 days after a judge notifies the attorney general before the judge can rule a state law unconstitutional. Our take: VOTE NO. This is a clear violation of our state’s separation of powers doctrine. The doctrine helps ensure that the branches of government can exercise their powers without interference from another branch. The Texas Legislature should not be authorized to enact laws that might undermine this doctrine. Translation: This amendment would expand upon a proposition passed by voters in 2015 that authorized professional sports team charitable foundations to operate charitable raffles. This new amendment would extend the definition of professional sports teams — which currently are limited to 10 — to include certain minor league sports teams, motorsports racing teams, Professional Golf Association events, and other teams in Texas. Our take: VOTE YES. While we aren’t big fans of gambling, we recognize how the sale of these raffle tickets could benefit nonprofit and charitable organizations within our state. This amendment would allow more sports organizations to hold raffles for the purpose of raising money for more charities. Translation: This amendment would allow the Legislature to create a property tax exemption for the surviving spouses of police officers, firefighters and other first responders killed in the line of duty. It would entitle a surviving spouse to a 100 percent exemption from taxes on the value of his or her house. However, a surviving spouse who remarried after the first responder’s death would be ineligible for the tax exemption. Our take: VOTE YES. We believe our state should do all it can to lessen the financial burden and help families whose loved ones gave their lives in service for us all. Translation: This would allow the Legislature to allow banks, credit unions and other financial institutions to promote savings by offering customers prizes drawn at random in exchange for deposit activity. Our take: VOTE NO. While we recognize that too many Texans do not save enough money for a rainy day, and that some might be inclined to save more if induced by winning raffle prizes, we do not believe that the Legislature should allow a special privilege to just one for-profit industry. This would provide an unfair carve-out for one industry and would be the only non-charitable raffle allowed in the state.